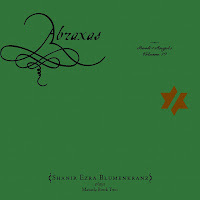 Shanir Ezra Blumenkranz's interpretations of John Zorn's second Masada book is a raucous one that is full of energy and urgency. In fact, the Tzadic website describes it well as the "most primal and tribal installments in the Book of Angels series"
This power quartet of sorts is Blumenkranz on the gimbri - a bass-like instrument from Morocco, Aram Bajakian and Eyol Maoz on very electric guitars, and Kenny Grohowski on drums. Sharing in some of the energy and rawness of Marc Ribot's Asmodeus, Abraxas devilishly mixes the dark klezmer melodies and rhythms with full on free-punk-jazz energy. However, it would be quite wrong to lump the whole affair under a label like punk, which can suggest a certain well worn consistency. Songs like 'Yassreil' is atmospheric and mysterious, 'Muriel' blistering, and the 'Nahuriel' begins with a prog-rock like set of riffs before devolving into a whorl of distorted guitar. Suffice to say, at the tunes all have their own identity within an approach that is insidiously infectious. Perhaps the relative simplicity of the gimibri could be seen as the core of the recording. It has three strings, one of which is a drone, and overall lends itself well to the looping bass lines of the songs. It is from these lines that Bajakian and Maoz spin feral melodies and Grohowski pushes them along deftly, like on 'Nachmiel', which starts with a comfortable melody and soon evolves into a multilayered free-rock affair. There is a certain consistency to the music, there is a certain amount of cohesion that connects this book of songs, and there is a wonderful contrast between the delicately melodic and thrillingly thrashing.